The first step in the formation of a filopodium is the nucleation of actin filaments from G-actin monomers. This is facilitated by various proteins known as nucleators, and may occur via the ‘tip nucleation model’ or the ‘convergent nucleation model’. In the former model, members of the formin family of proteins cluster at the plasma membrane and initiate the nucleation of actin filaments; in the latter model Arp2/3 complex nucleated branches continually develop from the actin filament network located at the leading edge of the lamellipodia. Current research into these models suggests that both remain plausible mechanisms for actin filament nucleation and filopodia initiation in vivo, however only the “convergent elongation model” is supported with direct experimental evidence. Much of this evidence is based on the effect of modulating activators or regulators of the Arp2/3 complex, although some findings are directly attributed to the expression and function of the Arp2/3 complex itself. One such study suggested that filopodia containing factin-1 mediated actin bundles formed from existing lamellipodia, and were important in serving as a template for the formation of new lamelliopodia . A: NPFs (e.g. 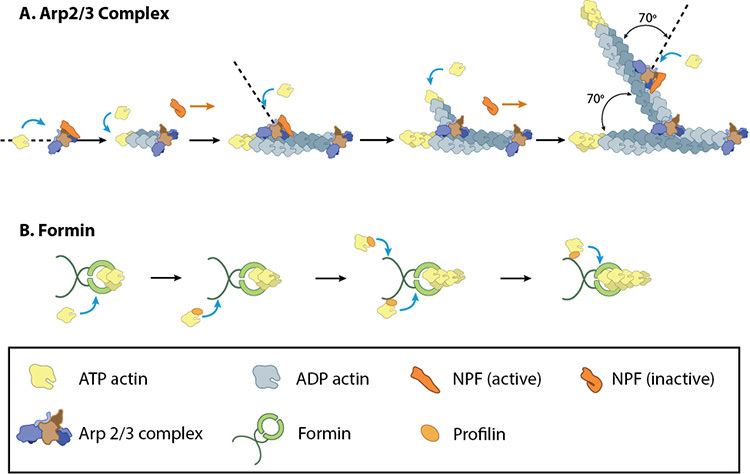 WASp; Scar) bring together the Arp2/3 complex and actin monomers to nucleate new actin filaments and to form new branches from the side of pre-existing filaments. Arp2/3 complex remains at the minus end of the filament. 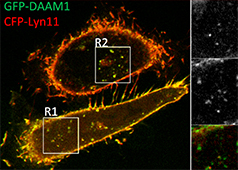 B. Formin cooperates with profilin to nucleate new actin filaments. Formin remains at the plus end of the filament. It has been shown, for example, that Arp2/3 knockdown in cultured neurons  as well as loss-of-function mutations in C. elegens  and cultured Drosophila neurons , leads to a disruption in filopodia initiation and subsequently a decrease in the number of filopodia. Modulation of nucleation-promoting factors (NPFs) that act directly on Arp2/3 have also been shown to influence filopodia initiation. In one example, targeted depletion of SCAR by RNA interference reportedly inhibited both lamellipodia and filopodia formation in Drosophila where as depletion of N-WASP did not . It has also been reported that although N-WASP was not essential for filopodia formation, its activation lead to an increased number of filopodia, again implicating the Arp2/3 complex in filopodia initiation. This was observed in COS-7 cells co-expressing N-WASP with a Myc-tagged Cdc42 mutant (an activator of N-WASP) where ‘extremely long’ microspikes were described in half the anti-Myc positive cells . Similarly, expression of a mutant form of WASP (Y291E), which mimics phosphorylated Tyr291, was shown to induce filopodia in macrophages more effectively than wildtype WASP . The same study also reported that filopodia formation was induced in macrophages as a result of WASP over-expression, and noted that WASP co-localized with F-actin at the filopodia base . 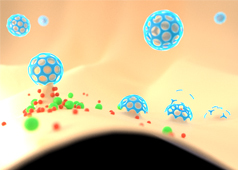 More recently, Robo4 was shown to induce filopodia formation in endothelial cells. This role was attributed to its activation of NPFs such as WASP, which in turn activates the Arp2/3 complex. It was also proposed that Robo4 may act as a molecular scaffold for the recruitment of of proteins that mediate actin nucleation . Additional experimental evidence supporting the “convergent elongation model” has been summarized extensively .